Are we witnessing the transformation of a democratically elected government to a dictatorship? What will be the next step that we need to look for to prove that in fact the government of Michel Martelly is transforming into a Dictorship? Is this possible to reestablish dictatorship in Haiti? Please list some of the signs you have noticed to make you believe the government of Martelly is transforming into a dictatorship? 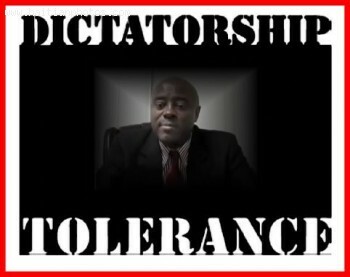 Why do you think the government of Michel Martelly has not been, is not and will never be a dictatorship? MWEN PAP REPONN OU PASKE SE YONN NAN AYISYEN SAN KONPRANN YO OU YE, MWEN RESPEKTE OPINYONW, MEN KOM OU DIM M PA GEN RESPE POU JOUNAL LA NAN BETIZ, MEN OU MENM OU FE PI MAL PASE MACHANN PISTACH OU BYEN MACHANN PWASON EPI GASON PA KONN DI BETIZ AK GESON PAREY YO, MEN MALEREZMAN OU MENM OU GEN LE GEN TI MOTO .KISA OU KONPRANN LE YON MOUNN DI BETIZ SAM DI A VLE DI AN FRANCAIS < ALLEZ VOUS EN >SE KAPAB SE SA OU PAKONPRANN LEM TE DI A, PASKE EDIKASYON W PA PEMET OU KONPRANN. How do you want the President to react when you asked him 50 millions of gourdes for each municipality. In order for you to do the work the people vote you in. as usual you went to bribe the Prime Minister and President Michel Martelly you know damn well he will not go to Business as usual. If you stop your bribery you will find a democratic Leader. But if you fail to do your job and try to still the people of Haiti you will encounter a strong progressit Dictator.